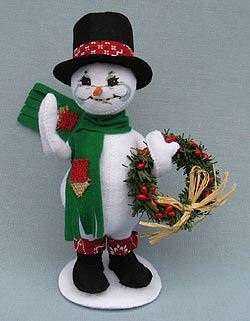 Home :: HOLIDAYS :: CHRISTMAS DOLLS :: ANNALEE SNOWMAN :: SNOWMAN 8" to 12"
Annalee Doll Description: Open eyes, closed mouth smile, black top hat with red bandana band, green scarf with two patches, black boots, holds wreath accented with red berries and a natural jute bow, white base. Annalee Doll Description: Open eyes, closed mouth smile, red Santa hat with white fur trim and pom, green scarf with snowflake, black boots, red skis, holds ski poles, white base. Annalee Doll Description: Open eyes, closed mouth smile, blue cheeks, white sparkle body, black hat with acrylic snowflake/red snowflake band/ brass bells, red snowflake print scarf, huge belly, holds pipe and broom, white felt base. Companions are 748906 and 749306. Annalee Doll Description: Open eyes, smiling, blue cheeks, white sparkle body, light blue sparkle scarf and hat accented with acrylic snowflakes, holds broom and snowflake, white felt base. Companion is 749706. Annalee Doll Description: Open eyes, smiling, blue cheeks, white sparkle body, light blue sparkle cloak and hat accented with acrylic snowflakes, holds silver wreath with blue snowflakes, white felt base. Companion is 749606. Adorable set. Annalee Doll Description: Open eyes, black pom nose, black battered hat with green band, green earmuffs, red scarf, green mittens, two pom pom buttons, black boots, holds broom, snow base. Annalee Doll Description: Last one. Open eyes, closed mouth smile - as shown, black pom nose, black battered hat with green band, green earmuffs, red scarf, green mittens, two pom pom buttons, black boots, holds broom, snow base. Very slight shelf dust on white flannel body. Sold as is. Annalee Doll Description: Last one. Open eyes, closed mouth smile - as shown, black pom nose, black battered hat with green band, green earmuffs, red scarf, green mittens, two pom pom buttons, black boots, holds broom, snow base. Very slight shelf dust on white flannel body and two light spots the size of peppercorns on left hip. Sold as is. Annalee Doll Description: Signed by Chuck Thorndike. Open eyes, orange carrot nose, beige felt hat, blue bow tie, patchwork print vest, 3 black pom poms down the front, holds a bird in one hand and a tan burlap seed bag in the other, white snowy base. Great piece to leave out all winter.Perfect gift for any bird lover. Companion is 751397. Annalee Doll Description: Last one. Open eyes, blue cheeks, resin carrot nose, black hat with plaid band, green scarf and gloves, red and green plaid vest, holds garland candy cane accented with red and white bows and pine cones, holds "Happy Holidays" card. Annalee Doll Description: Open eyes, white body, blue cheeks, orange carrot nose, burgundy hat and coat, black boots, holds "Joy". Annalee Doll Description: Open eyes, white body with three peppermint candy buttons, blue cheeks, orange carrot nose, black hat with peppermint band, red scarf, green mittens, black boots. Rides red and white stripe saucer with a small snowman wearing a red and white striped hat and scarf. Very common for sides to flip up due to storage and shipping. They came directly from Annalee Company this way. Annalee Doll Description: Open eyes, blue cheeks, resin carrot nose, red Santa hat with white fur trim and snowflake at the end, red jacket with white fur trim with two holly designs, sparkle green mittens, black boots, holds a red stocking with gifts in it in each hand. Companion is 754804. Annalee Doll Description: Open eyes, white body, blue cheeks, orange carrot nose, red hat with holly, forest green vest with three red buttons, red jacket with white fur trim, black boots, holds candy cane shaped holly. Companion is 754805. Annalee Doll Description: Open eyes, blue cheeks, resin carrot nose, red hooded jacket with white fur trim with two holly designs, sparkle green mittens, black boots, holds a red stocking with gifts. Companion is 754704. Annalee Doll Description: Open eyes, white body, blue cheeks, orange carrot nose, red fur trimmed hat with holly, red jacket with white fur trim and holly, black boots, holds candy cane shaped holly. Companion is 754705. Annalee Doll Description: Open eyes, white body, blue cheeks, orange carrot nose, black hat with peppermint band, red scarf, green vest with three peppermint candy buttons and trim, black boots, holds candy canes. Larger companion is 753305. Annalee Doll Description: Open eyes, blue cheeks, green vest, hat/coat/boots accented with harlequin trim. Companion is 760507. Annalee Doll Description: Open eyes, white body, black top hat, red coat with white fur trim, green scarf with "Coca-Cola", holds bottle of coke. Companion coke items are 760012, 760112, 760212, 760312, 501013, 600013, 750813 and 601213. Annalee Doll Description: Open eyes, blue cheeks, green scarf, hat/coat/boots accented with harlequin trim. Companion is 760407. Annalee Doll Description: Open eyes, blue cheeks, red snowflake hat, green snowflake scarf, holds snowballs. Companions are 749306 and 760207. Annalee Doll Description: Open eyes, blue cheeks, pipe, black hat, red snowflake scarf, holds broom. Companion is 760107.